Where ever in the world you decide to acquire SUP instructor certification, safety is the primary focus. Courses done well is a common theme along with consistency in an effort to standardize teachings world wide. WPA (listed first) sponsors certified instructors across the country and beyond. Listed here are both profit and non-profit associations. The WPA offers four certified levels of instruction. WPA Class III certification, multiple specialized water safety training and able to write a safety examination. A WPA Class III instructor may petition to become a Master Class I instructor two years from the date of completing their Class III certification class. Paddle Core Fitness offers a beginner and advanced program. All paddlers must be capable paddlers. 2 day and 4 day certification program. Beginner lesson, gentle wave, nautical flow and surfer's sculpt classes. PaddleFit is a fitness system that includes both land based workouts, paddling technique and water based workouts. PaddleFit offers Level 1, 2 and 3 in Key West FL, San Diego CA, Tampa Bay Area FL, Jupiter FL, Grand Haven MI, Phoeniz Area AZ, Tulsa OK, Fenwick Island DE, and Wasaga Beach in the Toronto area in Ontario Canada. Paddle Into Fitness offers a two day SUP Certification program and a four day SUP Yoga Certification program with professional Roxy Stand Up Paddle athlete Gillian Gibree. Both WPA and Yoga Alliance are their sponsors. Kayak, canoe and stand up paddle boarding school and local paddle shop. UnderCurrents offers repair, boat and gear rentals and outfitting. Paddle Canada was born in 1971. The organization started as the Canadian Recreational Canoeing Association (1971 – 2006). After examining current trends stand up paddle boarding (SUP) was added and the name changed to Paddle Canada. National standards for sea and river kayaking were already in place and now the long term goal includes the development of standard skill sets for all recreational paddling..
3 day program trains SUP paddlers to teach the Paddle Canada Introductory SUP Program. As well a 3 hour Advanced Flat water course builds on the 3 day program. The BSUPA works with other related governing and non governing bodies to standardize and make consistent regulations and safey for SUP surfers and flat water paddlers. 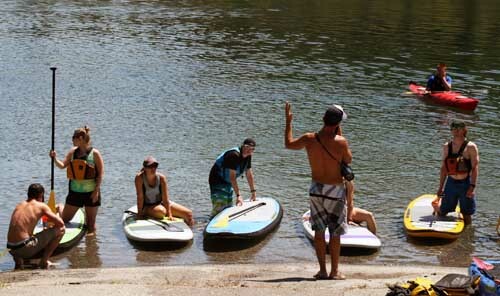 To find more details for SUP instructor certification click on the following link.